The Greater White-fronted Goose (Anser albifrons) is a goose species closely related to the smaller Lesser White-fronted Goose (A. erythropus). 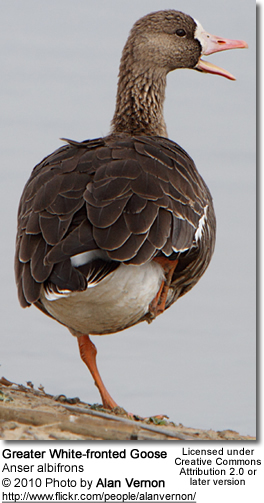 In Europe it has been known as simply "White-fronted Goose"; in North America it is known as the Greater White-fronted Goose (or "Greater Whitefront"), and this name is also increasingly adopted internationally. In Northern and Central North America, it is colloquially called "Specklebelly" due to the salt-and-pepper appearance of the underside. Greater Whitefronts are 65-78 cm in length and have a 130-165 cm wingspan. They have bright orange legs and mouse-colored upper wing-coverts. They are smaller than Greylag Geese. 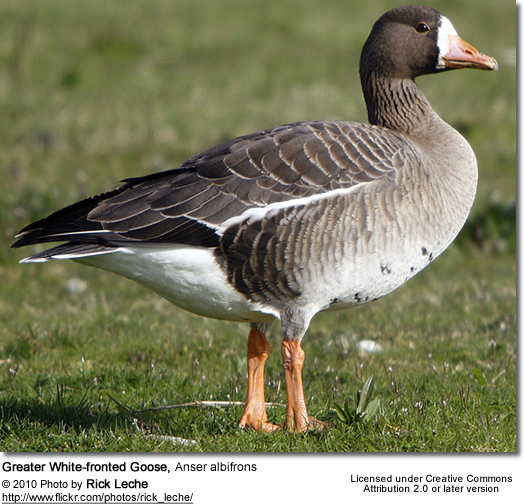 As well as being larger than the Lesser White-fronted Goose, the Greater Whitefront lacks the yellow eye-ring of that species, and the white facial blaze does not extend upwards so far as in Lesser. Both white-fronted species have a very conspicuous white face and broad black bars which cross the belly, though the last two characters are occasionally observable to some extent in the Greylag Goose, which, however, has the bill and legs flesh-colored, and pale bluish-grey upper wing-coverts. 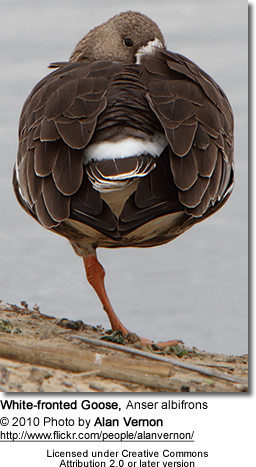 The Greater White-fronted Goose is divided into five subspecies. The nominate subspecies A. a. albifrons breeds in the far north of Europe and Asia, and winters further south and west in Europe. In the far east of Siberia east to Arctic Canada, it is replaced by A. a. frontalis, slightly larger and with a marginally longer bill, wintering in the United States and Japan. 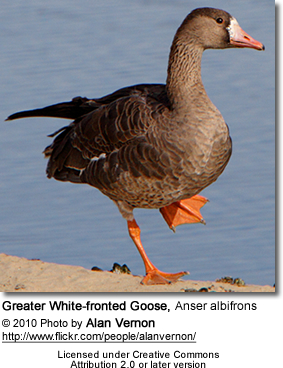 Two other restricted-range races occur slightly further south in northern North America; A. a. gambeli in interior northwest Canada, slightly larger still and wintering on the U.S. Gulf Coast, and the doubtfully distinct (Carboneras, 1992) A. a. elgasi (Tule Goose) in southwest Alaska, largest and longest-billed of all, wintering in California. All these races are similar in plumage, differing only in size. 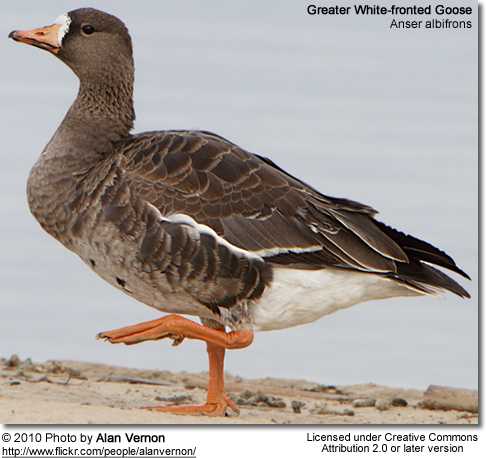 Finally, the very distinct Greenland White-fronted Goose A. a. flavirostris breeding in western Greenland, is much darker overall, with only a very narrow white tip to the tail (broader on the other races), more black barring on its belly, and usually has an orange (not pink) bill. It winters in Ireland and western Scotland. Recent ecological studies suggest the Greenland birds should probably be considered a separate species from A. albifrons. Of particular interest is its unusually long period of parental care and association, which may last several years and can include grandparenting, possibly uniquely among the Anseriformes. In the British Isles, two races overwinter: Greenland birds in Scotland and Ireland, and Russian birds in England and Wales. They gather on farmland at favoured traditional sites, with a famous flock gathering at WWT Slimbridge, Gloucestershire, England. Greenland birds also overwinter in Ireland and from late September and through the winter months, Ireland is home to almost 50% of the Greenland population of white-fronted geese. A. a. albifrons and A. a. flavirostis are among the taxa to which the Agreement on the Conservation of African-Eurasian Migratory Waterbirds (AEWA) applies. 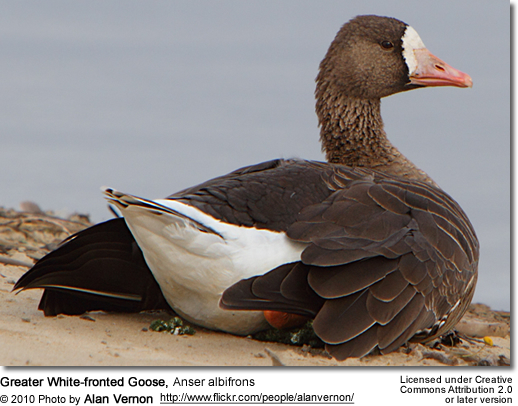 The Tule White-fronted Goose is very rare and has been since the latter half of the 19th century, presumably it was affected by destruction of its wintering habitat due to human settlement. Fox, A.D. and Stroud, D.A. 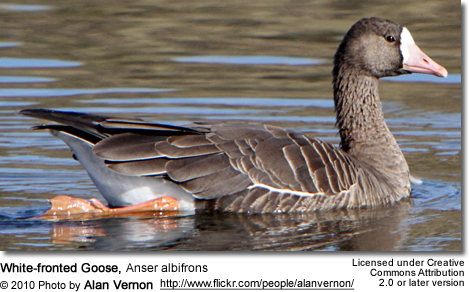 (2002): Greenland White-fronted Goose. Birds of the Western Palearctic Update 4(2): 65-88.